Uzbekistan's State Museum of Fine Arts has been making headlines again. Hard on the heels of its stash of Picasso ceramics, forgotten in storage for over 40 years, this week the museum revealed that it has a masterpiece by the Italian Renaissance painter, Paolo Veronese. Veronese, Titian and Tintoretto constitute the triumvirate of pre-eminent Venetian painters of the late Renaissance (16th century). Like the Picasso treasures, the back story about this work is intriguing. Grand Duke Nikolai Konstantinovich Romanov, grandson of Tsar Nicholas I of Russia, was a gifted military officer and a great womaniser. He fell passionately in love with an American divorcée, Fanny Lear. They travelled through Italy and France and his personal diary records that he purchased a painting by the Italian master Paolo Veronese in 1871-1872. Following a scandal in which he allegedly stole three diamonds from one of his mother's icons to give to his mistress, Nikolai was arrested and banished from Russia to Tashkent. In 1891 the Grand Duke, in permanent exile, constructed a palace for himself in Tashkent, today used as the Reception House of the Uzbek Foreign Affairs Ministry. This palace housed his art collection and, according to his will, on his death in 1918 the collection became the property of the Tashkent University. The entire collection was moved to the State Art Museum in 1920 and then transferred to the newly built museum in 1974. There the painting has hung attributed as artist unknown. For decades art students have viewed and copied the piece unaware of its origins. Fast forward to 2010 when Samarkand-born Dilshod Azizov joined the Fine Arts Museum and was assigned several older paintings to restore. Azizov, a graduate of the Tashkent Institute of Art and Design, had pursued further restoration studies at St. Petersburg's Academy of Arts under the Hermitage's famous restorer Mikhail Devyatova. Delicate compositional, infrared and ultrasound studies, as well as analyses of palette, colour relationships, the silk canvas and soil composition etc, were carried out. Under 19 layers of paint and laquer, the title of the work was revealed. Azizov was convinced that it was a Veronese original. On 27 November, a media event was held at the museum to announce the authenticity of the work. The museum was transformed into a Renaissance palace. The Italian Ambassador to Uzbekistan addressed the audience as did the Archbishop of the Russian Orthodox Church, Tashkent, and the Catholic Church's Bishop of Uzbekistan. The announcement has generated controversy: Veronese's famous painting The Descent from the Cross, hangs in the Hermitage. The paintings are very different from each other in construction and perspective. However, experts are convinced that Veronese engaged the same sitter to pose as Christ in both works. 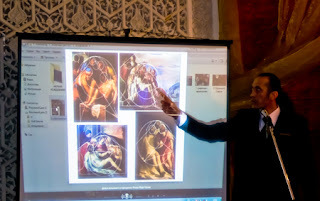 According to UZ News, which covered the event, Azizov stepped the audience through the layers of the painting and the verification process. On the screen Azizov showed how Veronese corrected the initial position of Christ's arm, removing his second leg; Christ's thigh was initially uncovered, but in the final version the painter covered it, probably in line with the Church's preference for modesty. 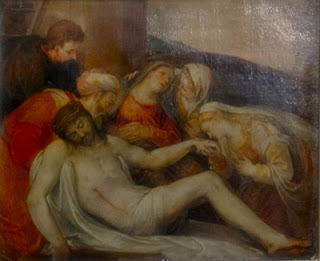 At one stage the owners cut off Christ's fingers to squeeze the painting into a frame. Uzbek specialists suggest that it may take two or three years to restore the painting after which it will be displayed again at the museum. The video clip below shows the museum decked in Renaissance splendour and the unveiling of the work. (If the clip does not how on your device, please go directly to http://www.youtube.com/embed/vFbIP0JxNg8).